I don’t think it’s any secret that I have a fondness for the creations of Ibizarre. I will always check out new releases! I got a notecard today and went over to check out the new dresses but could not make up my mind. Whilst gandering around at the other new releases though I came across THIS DRESS. This is probably not a surprise to anyone, but I have a habit of examining the neckline of just about anything I buy for obvious reasons. The neckline on this dress just sucked me in! I cannot help but admire the line. It is perfectly sized to display not only jewelry but well, um, your assets. There’s such a 70’s feel to this dress that I had to have it. Fair warning. I’m not crazy about the alphas on the skirt. I think I may have chosen to put an opaque layer underneath the alpha – although I see this as perhaps a design decision to get a certain look. In any case, for me this is just a minor distraction. I will probably modify it myself somehow to suit my preference. The whole line of the dress got me into a Stevie Nicks frame of mind, and damn but did GField just release the perfect retro ankle boots? Yes they did, I felt that they worked perfectly with the dress. 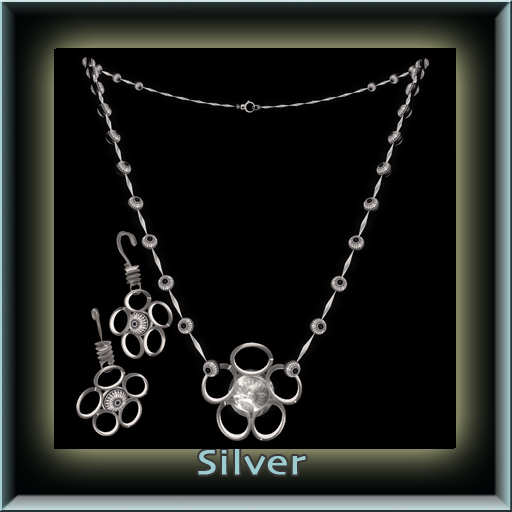 I put on my own Daisy Diamonds jewelry set, a new release. I really like this set because I was not just going for silvery and pretty. I was trying to evoke a feeling with it, it was to feel casual & unique. A perfect little nothing if you will. Anywho, I pulled out the moth stockings cause I didn’t care for the bare leg on the skirt, and chose the new Michelle 2 hair from fri.day (I was required to buy this hairstyle lol). Of course skin is the base for most outfits in SL, and basically makes a look. I chose the latest skin from Fashionably Dead. Fair warning on this skin too – it may not be for everyone. However – I am currently obsessed/fascinated by the face of this skin. 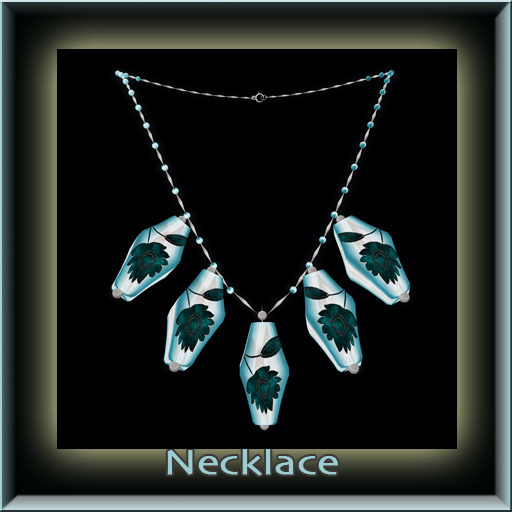 Sometimes things I see and/or buy in Sl evoke a memory of something that made me feel a certain way – happy/sad/angry I don’t know. This skin does that for me. It evokes a memory of something, maybe something from when I was much younger, I don’t/ I can’t put my finger on it. In any case, it’s stunning to my eye. And so that’s my outfit for today. I have not blogged a look in a while, but was really inspired by the dress. Oh happy, happy, hump day! Hello out there….Yes it’s another week, another hump day! YAY! Yay for me in particular, cause I can’t wait for the week to be over! I have a lovely little piece for hump day this week. Eventually it will be available in three metal options, but for now it’s just in copper. 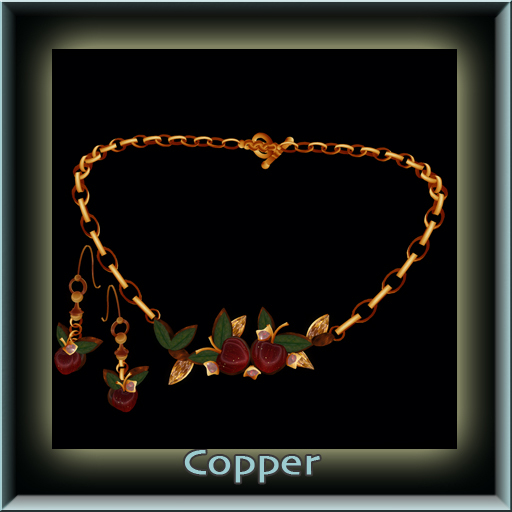 It’s the Apples & Opals set, for rather obvious reasons and I have to say, I LOVE it. I hope you do too! Stop by starting midnight tonite and pick it up for the special hump day price of only $69L! (well actually it’s out now lol….) OH and I apologize if the pictures are not perfect – unfortunately my connection is meh. Here’s a teleport directly to the store. What do jewelers dream about? 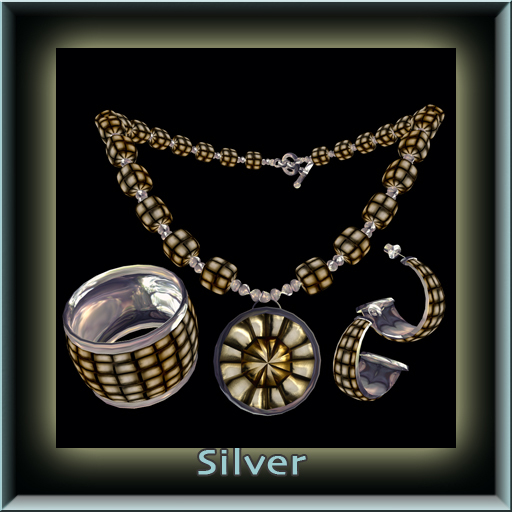 Jewelry designers in Second Life frequently build fantastic pieces to go with the fabulous creations of clothing designers. Did you ever wonder what a jeweler would like to SEE with their creations – to have a designer make an outfit that is designed to go with their creation, instead of the other way around? What do jewelers dream about? I’m so excited to announce that I’m participating in this event! 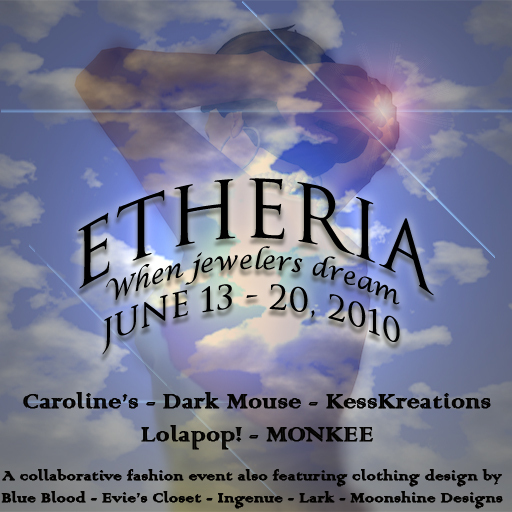 I’ll be working with Sienia Trevellion of Lark, a designer that I adore! Moaaaarrrr NEW Stuff at Dark Mouse! Yes, yes, I had even more new stuff for you! This week I’m releasing my latest necklace, Vintage Troll, “next” the Daisy Diamonds necklace in copper and gold and new set of bangles I’m calling, Glass and Wood, cause well I’ve run out of brilliant names and that’s what they are! All three are experiments in building things differently. I hope you like them, I hope you’ll stop by and pick them up! OH – I’ve also put two older sets into the lucky chair. One is abstract extravagance, the other is mussed up – also my black & white drama set is still there! Stop by and get LUCKY ;-). Here’s a teleport directly to the store. Hi there my fellow second lifers! I’m participating in the 69L Hump Day Happiness special again, and having fun with it. 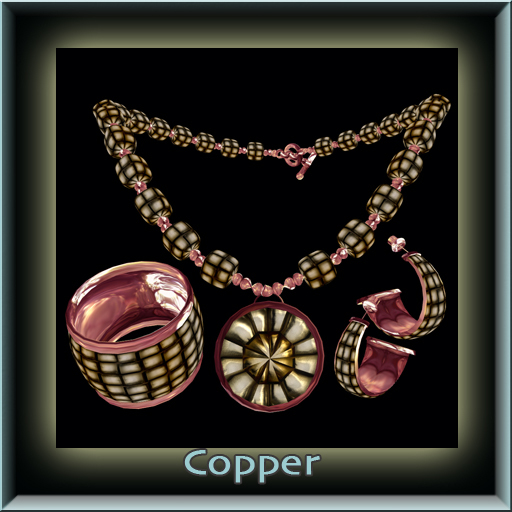 I have been interested for a long time in making clothes that combine extensively with ‘jewelry’ or extensive prim work, and so followed that idea to its logical conclusion. I made a shirt with extensive prim attachments. I LOVED making it. Is it perfect? No. Does it compete with what you normally see from designers? No. Did I have a fricken awesome time making it and fooling with templates and photoshop and what not? HELL YES <3. Isn't it what SL is all about? Testing yourself – building, creating, having fun? Go have fun. And if you have a yen, stop by my shop and pick up my Rose Camisole. I love you all. Here’s a teleport to the store! Oh and I should mention the skin in the ad is from Fashionably Dead, the hair is fri.day and the skirt is a beloved oldie but goodie from Pixel Dolls and I love all of them. All you need is love. 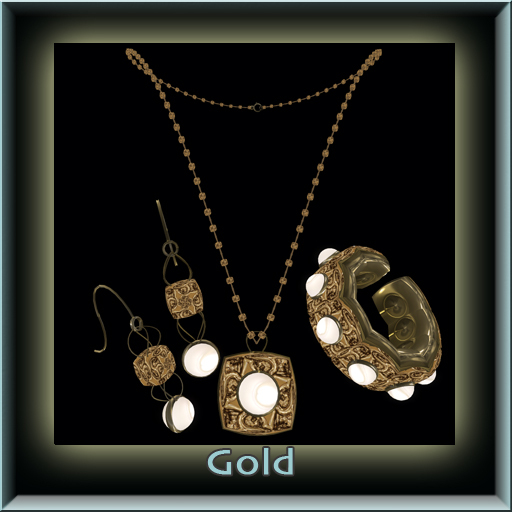 New Releases at Dark Mouse Jewelry! Hi there my lovelies. I have new releases! YAY! I’ve been working on a couple of projects for a while – I’m a slow burn as they say. The first thing I was working on was making a texture that looked like it had been made from some kind of old bone, specifically chipped bone. Where do these ideas come from? No idea LOL. The other idea I had was to create a texture that looked like plastic or lucite. Hopefully I’m close on both counts. The first jewelry set is called, Fossilized. It comes in Silver/Gold/Copper and is pretty striking if I say so myself! The second set is called, Embrace of Flowers. Both sets come with necklace, earrings and bracelets. 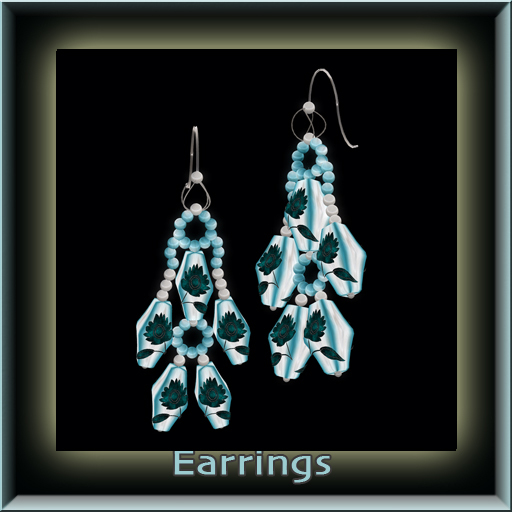 Each set could be worn together, or each piece just by itself. Anyways – both sets can be acquired at my shop! Here’s a teleport to the store. Oh and in case anyone asks, the skins in the ads are the lovely new Letluka skin, Lola and Curio, Elf. Also while I was at it, I put a couple of new sets in the Lucky Chair and if I must say so myself, THEY ARE GORGEOUS! Because we all need a little to get us through the week…..
Hi there! I’m happy to report that I’ll be participating in the Hump Day Happiness promotion this week! 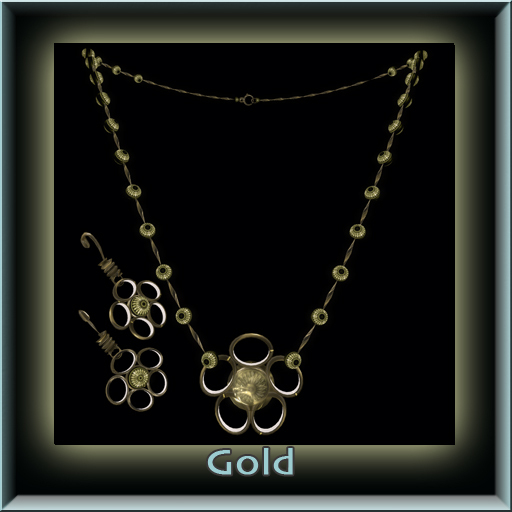 Here’s a picture of my set, called Daisy Diamonds, only $69L, stop by the store for a list of participating vendors and enjoy! Oh this is a NEW RELEASE – it will be full price soon and available in Gold and Copper too! Click this link for taxi right to the shop! What? I’m building again. It feels pretty good and well timely….. I do have a few things coming up. One of them is a SURPRISE! The other is that I’m participating in a hunt. And well busy busy. I have this crazy idea…. So I thought I’d do a blog post. I love these jeans. My essential jeans from Nyte & Day. I paired it with an absolute find of a top from Lark – talk about right up my alley, romantic yet casual. 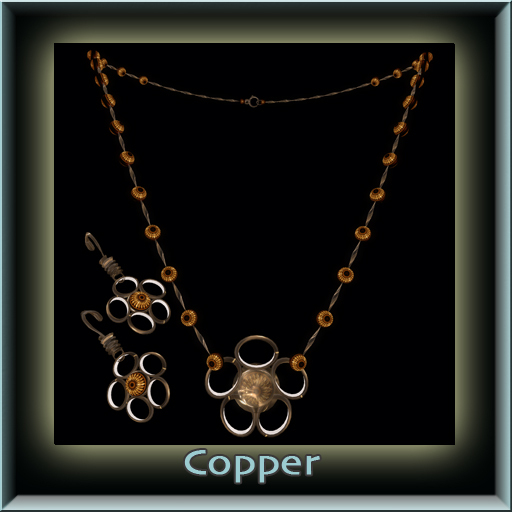 That required pulling out the big guns and pairing it with my own romantic, yet casual Je t’aime jewelry set in copper. The skin I’m wearing is League, and can I just say, I’ve not worn it in a while and well I just don’t know why, talk about a sensual skin! I would love to see some new skin from League. I gave up trying to get in to The Deck for the gift skin from Tuli – maybe it will go out as a group gifty?? hint, hint, nudge, nudge??? I splurged on some new hair from fri.day, Yelena2. Yes I felt like clogs, what of it? These are from Duh! a great shop filled with delightful and affordable shoes. I accessorized a bit more with my own hip hugger belt. 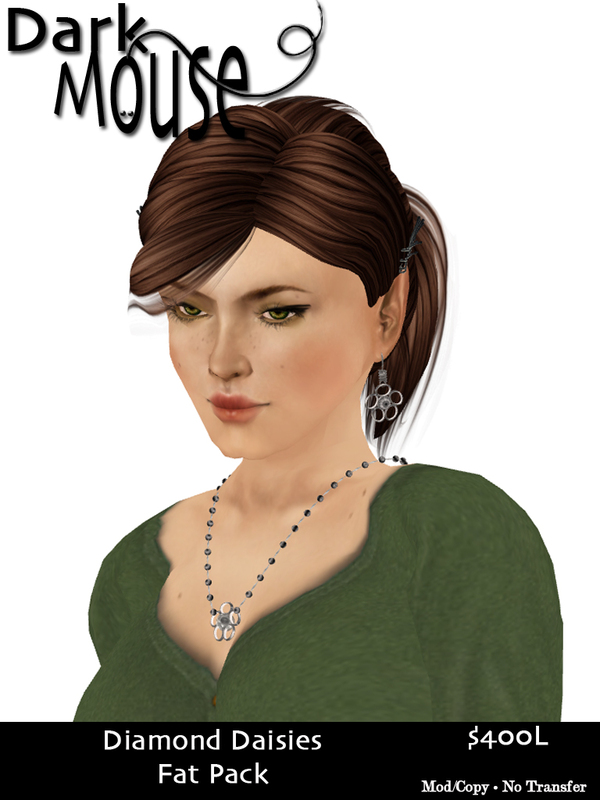 YAY, fun outfit – I took the pics at my new Linden home in somewhere, god I can’t remember the style, quad maybe? Anyway I set up a photo studio there! Romantic, yet casual. Shoes – Slip on Clogs (Black) – Duh! Hi all, I promised Teagan to get my free hair out at Savoir Hair, well, a month ago. I’m so sorry I’m late. 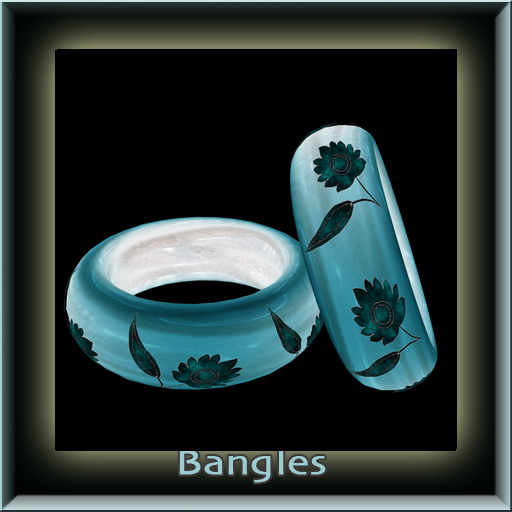 It’s finally there – here’s a slurl to Savoir Hair, the largest selection of FREE hair from the most fabulous designers in SL! It’s also available in my main shop. Meet Alex – available for FREE in all colors. Enjoy!